This seemingly innocent sounding question can bring dread to those working in a technical field as they try to explain just what-it-is that makes up their profession. Struggling to find applicable terms to describe basic, high-level concepts, can leave one looking like their job is... essentially inventing words. Red5 Pro is a technical product. Therefore, when discussing our offerings and features, there can be some specific language and acronyms that not everyone will be familiar with. This post is an attempt to breakdown some of those common phrases and let you what exactly what it is that we "do". If you are a developer, then go ahead and skip this post, or use it for ammo when explaining to your grandparents how you manage to fill an entire working day doing "computer stuff". Two of our main offerings are the HTML5 SDK and the Mobile SDK for both iOS and Android. SDK stands for "software development kit". As the name implies, that means that an SDK is a set of programming tools that enable a programmer/developer to code applications for a specific platform. That platform could be a computer system, hardware platform (such as a video game console), software framework or similar development platform. The tools provided are things like code libraries, documentation, code samples, processes, and/or guides. For example, our HTML5 SDK includes the Red5 Pro HTML5 library, the documentation, and code samples. For more on how our code samples work, please take a look at this blog post. Those that have dug a little deeper may have found another unfamiliar acronym: API (Application Programming Interface). An API is a routine, protocol, or interface which specifies how software components should interact. Where the SDK provides the tools to build an application, the API is the raw material for building it. The entire internet (and all computer functions for that matter) run off APIs. 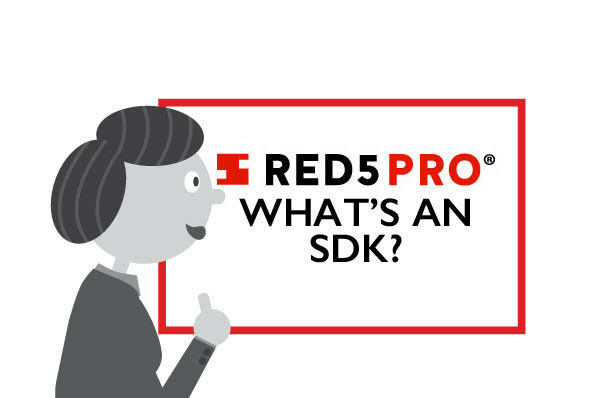 They provide a series of instructions of sorts, for all the variables and methods contained within the Red5 Pro SDK to communicate across not just the entire application but other software platforms as well. The Mobile SDK can send information to the HTML5 SDK which can then interact with the Chrome or Safari browser. The SDK allows you to build a meshwork of API interactions beyond the scope of any single API. As such, this means that Red5 Pro is not a stand-alone application. It has to be assembled. Furthermore, it may not have ALL the parts and features you are looking for. The SDK won't write itself. It may need custom code to meet your exact specifications. The SDK and API are meant to make it easier to code. Of course, we can certainly help you out with any of your custom needs. All in all, this is to say that Red5 Pro is a powerful toolkit that will allow you to build fully scalable applications with low-latency, realtime live streaming. If additional help is needed, we offer consulting and custom work contracts so our developers can grab their tools and assist you. For more information, send a message to info@red5pro.com or schedule a call.